"Being an authentic account of the writer's experiences, written for his own satisfaction, but free to be read by anyone who wants to read it." A New England farmer and MIT professor's stories of his transition from horse-and-buggy to automobile in 1918. Adventures with "Lizzie," a 1918 Model T Ford, and "Caddie Maria," a 1912 Cadillac - delightfully told with matter-of-fact Yankee humor. 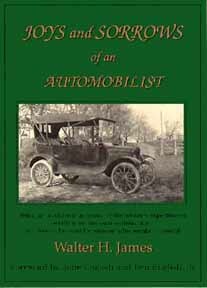 "Anyone who had ever driven a car should read `Joys and Sorrows of an Automobilist' in order to learn about the beginnings of automotive travel in this country. It is full of chuckles for those who remember those days or heard about them first-hand from their parents. It should provide eye-opening and hair-raising accounts for modern drivers who never had to crank a car by hand, or get out and push one through gooey mud or deep sand." "Though written in 1918, this book captures the essence of everyone's relationship to the automobile. Indeed, this slender monograph proves a jaunty delight from page one."